To understand how 4D works, imagine if you could travel forward into time and set up a camera at a job site that takes a picture each day, from multiple perspectives, of a project being constructed. Impose on each frame a readout of the day the shot was taken, make each element of the construction clickable and data-rich, and you will have an idea of what 4D portrays—before construction even starts. Basically, it is an “animated,” intelligent sequence of a virtual project being constructed. Accurately revealing the relationship of time to the construction phase is just one of the valuable advantages that 4D will bring to the table as its use becomes more widespread. Consider an addition to a manufacturing facility as an example. The client is negotiating a large product order and needs to know at exactly what stage their addition will be on a date in the future so he can develop a proposed production and delivery schedule. While the project manager could come up with an estimate by referring to a detailed project schedule, 4D will accurately show the physical status of the project for any given time period. The answer is not only more accurate, but once the model is in place, it is also instant. This will have a significant impact on business decisions. When reaching a certain milestone depends on completing a particular phase of the project in a specific time frame, it will now be possible to optimize the construction schedule to accomplish that. Thinking of 4D as “intelligence” isn’t too unrealistic. 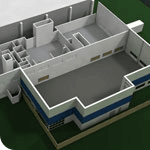 For a recent proposal, SSOE and contractor Alberici collaborated to develop a 4D model of the proposed facility. An SSOE project architect discovered when viewing the model that there was a four-week “dead” period in the construction schedule. Realizing that the sequence of tasks that had been developed did not take into account the time needed for a concrete floor to harden, he was able to reconfigure the sequence and close the gap to optimize the overall schedule. 4D allows the team to see flaws and opportunities as the proposed schedule is played out on screen and collaborate as a multi-disciplined team to develop alternate approaches or work-arounds. Its ability to reveal the intricate details of a construction project will have huge implications when determining the level of usability in an area under construction. A project schedule can tell you when an elevator will be installed, but 4D will reveal when the conditions of the site and progress of the work will allow it to actually function. Such finite details affect multiple decisions related to staffing, safety, productions schedules and more. To anticipate such finite timing without 4D is almost impossible. The alternative is to pour over the project’s multi-page Gantt chart schedule. In addition to yielding limited accuracy, these schedules are cumbersome for an engineer or contractor and typically too confusing for a layperson to interpret. On the other hand, when an owner sees a preview of how his project will actually come together, he will have more confidence in the team and the outcome. What will need to happen back in the office to create a 4D? The construction manager will develop a project schedule and provide that to the engineers who created the design. Often the schedule will have been developed in a program such as Primavera and can be linked to the 3D CAD model. It sounds effortless, but it isn’t because it requires that project information is determined and entered earlier in the process. It also requires close collaboration between engineering and construction staff. Complex projects are the best candidates for 4D because the advantages clearly outweigh the additional effort. With the many factors that impact construction projects, 4D will make it possible for facilities projects to come closer to the universal goals of tighter orchestration and greater predictability, making business decisions that much easier. For more information on how 4D can help you on your next project, contact Vince DiPofi at vdipofi@ssoe.com.